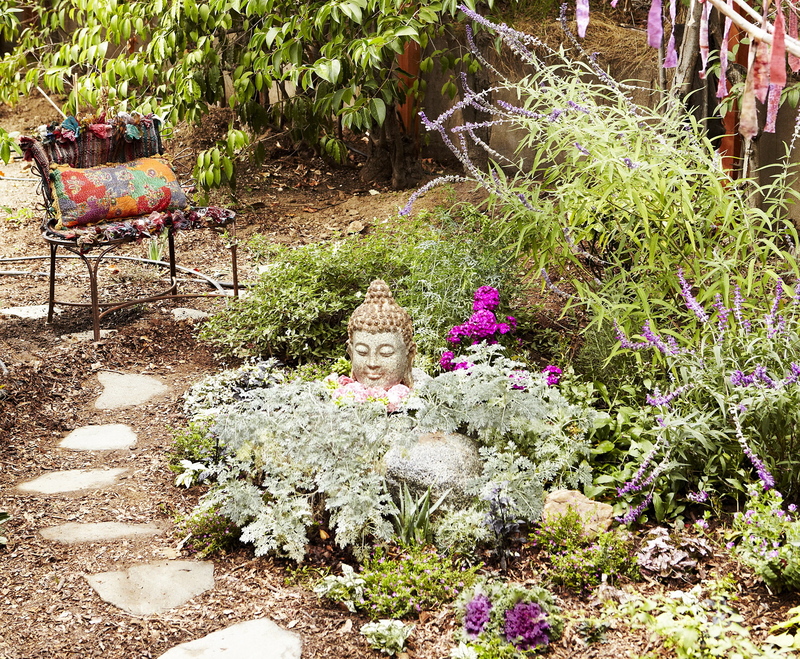 To transform her Altadena yard into a restorative garden retreat, writer Annie Retamal called upon Melinda Joy Miller, a permaculture expert, feng shui master and healer who is the author of a new book, Shamanic Gardening: Timeless Techniques for the Modern Sustainable Garden (Process Media). Miller and her daughter Kim Colwell, also a feng shui master and an eco interior designer, together run the Shambhalla Institute, which helps clients transform their lives by shifting energies along with their décor and color schemes. Shamanic gardening combines sustainable planting techniques, indigenous teachings, Asian design, energetic balancing methods and psychological principles. For this lush half-acre property, Miller and Colwell helped create different spaces for different purposes and times of day – a place for morning writing, a meditation garden that reflects the moonlight at night, raised beds for growing vegetables, and areas where Retamal and her professor husband Ed Knell’s two kids, Milo and Alice, can run around and play, or sit down for a snack. With an emphasis on white and silver foliage and light blue, lavender and purple flowers, this garden is designed to tap into the intuitive energies of the moon. The silvery leafed Artemisia or Mugwort surrounding the Buddha head is both medicinal (for prevention of the common cold and flu), and a shamanic way to inspire deeper reflection and meditation. Sage and lavender can also be brewed together as a tea to lower blood pressure and calm the nerves. The curving mica stone path brings the flow of chi or energy directly to the meditation chair, which is placed in the abundance area of the garden, according to feng shui principles. The sunny yellow roof deck between Milo and Alice’s rooms is the perfect place for them to enjoy an afternoon snack. Potted herbs like mint and lemon verbena can be picked directly from the plants to make sun tea or added to sandwiches or lemonade. Captivated by the “bottle trees” she saw in photographs of the South, Retamal and her husband spent a year collecting cobalt blue bottles, with the stipulation that they had to be a gift or found serendipitously. Miller loved this sustainable concept, noting that according to ancient folkloric beliefs, spirit beings can be captured in a bottle. The color indigo, she added, has been used for thousands of years for protection. The vegetable garden is planted using the “forest method” of soil preparation to conserve water and supply natural fertilizer. First introduced by a 19th century scientist who studied the forest floor to figure out how to sustain healthy soil, Miller devised an updated, modern version, and has included specific instructions in her new book. Every aspect of this area was considered, from the position of the beds to the straw ground cover to the vines climbing up the back wall. Utilizing run-off from the kitchen water purifier, this cute and eco-friendly fountain is where Alice and Milo wash their hands and feet after playing in the yard. Floating flowers keep the water from getting stagnant.